Time of a season is limited and activities take place in real-time, so you have to manage your workers efficiently. Cook meals for them and watch for their fatigue to keep them happy (and working). As family members work they improve their skills, which makes them faster . 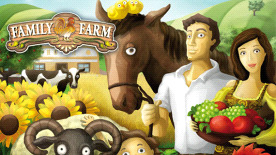 Highly skilled characters also have a much better chance of improving the farm as they work! Yields are determined by properties of crops in relation to soil fertility, weather and additional work. It can be expensive to hire help, but it can give you time to upgrade the house to provide space for a growing family... As the family grows you can expand your farm and focus on long-term investments such as livestock or orchard.